Amref Health Africa has also welcomed the move by the Government to reconfigure NHIF to align it to the Universal Health Coverage (UHC) agenda. Commenting on the 2018 budget, the Country Director for Amref Health Africa in Kenya, Dr Meshack Ndirangu says in order for NHIF to increase enrolment and retention, the Fund will need to deploy a customer-centric distribution system especially for the informal sector and also reduce administrative costs and build trust with the citizenry. “Financial protection is a core imperative in the UHC journey. Therefore NHIF should institute health service purchasing reforms, including adoption of an evidence based health benefits package, an effective system for monitoring quality of services, and an efficient and fool-proof claim processing mechanism, and accelerated accreditation of primary health facilities,” said Dr Ndirangu. He added: “poor people who cannot afford to buy insurance premiums need to be identified and a budget allocated to them by the national and county governments while at the same time improving their economic status through actions in the other Big Four,” said Dr Ndirangu. He said the future for UHC looks promising with the plan to pilot it in four counties – Kisumu, Nyeri, Machakos and Isiolo – where the lessons learnt will be crucial in informing scale-up to the other counties. Dr Ndirangu said trusted agents such as Community Health Volunteers, M-Pesa agents, SACCOs and chamascan be powerful distributors for NHIF. Dr Ndirangu said in order to achieve sustainable UHC, Kenya must balance investments in expensive high-tech machines such as CT scanners for specialized medical care at referral hospitals with low-tech, low-cost yet high-impact care at primary health care levels. “If we equip community health workers with skills on disease prevention and equipment such as blood pressure machines and glucose meters, people with elevated blood pressure and diabetes will be diagnosed and managed early. This way, we will have fewer people developing complications such as stroke and renal failure that require CT scans and dialysis machines,” said Dr Ndirangu. 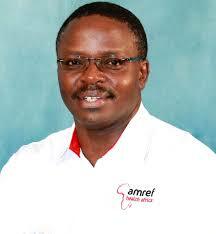 Amref is however also concerned by the low allocation of funds to Health which could slow down UHC realization. “Despite the measures proposed in the budget, we still have a long way to go. For a budget of KSh3.1 trillion, an allocation of KSh90 billion amounts to only 2.9% of the national budget which, even when later combined with what counties will allocate to health, seems way lower than the trajectory we need to take the allocation to 10% by 2022,” said Dr Ndirangu. He said in order to catch up; the Government may require significant supplementary budget measures.